MadiDrops are being used in a range of communities in over 40 countries, providing 65,000 people with a combined 30 million liters of safe water. Every day, those numbers increase! The overwhelming feedback is families enjoy using the MadiDrop to ensure their safe drinking water, and most importantly – their health improves. From day one, we have believed in the MadiDrop’s potential to have an immense positive impact upon global communities. As the manufacturer, we rely on humanitarian and mission-based organizations, commercial distribution companies, and social entrepreneurs to bring this message to the end user. To get there, they had to believe in the product themselves. Before launching their MadiDrop social enterprise, Seeds of Hope International Partnerships conducted a year long laboratory study in conjunction with community studies in Kaloko and Mapolo where diarrhea and other waterborne diseases are common due to substandard municipal systems and shallow hand dug wells. Testing over the year showed a reduction of up to 100% in disinfecting the water in overnight periods for water samples. For the few water samples with higher contamination, the water quality tested negative for E. coli and general coliforms at 24 Hours. Perception survey responses from the users said the smell and taste of the MadiDrop treated water was normal and that they would recommend the product to their friends. Whave Solutions works with rural communities in the Kamuli District where water sources such as boreholes often break down and experience repair delays, leading to high risk of waterborne illnesses. With the goal of launching a social enterprise, MadiDrops were introduced to four communities – Nakibungulya, Nawanende, Busuwa, and Bukubembe Kirangira – through “community sensitization meetings.” Community members revealed that they do not regularly boil or filter their water due to lack of time or firewood and rarely use chlorine due to smell. They were excited that the MadiDrop doesn’t have a chlorine taste or smell, and it remains in the container without needing any additional attention, and they’d be willing to pay for a MadiDrop. Overnight testing in all four communities done every month over the course of 6 months confirmed the MadiDrop worked as expected and fully reduced waterborne pathogen levels. Before beginning a program in Honduras, Water for ME, in association with the University of Maine, undertook a seven-month evaluation of MadiDrop efficacy. Tests demonstrated the MadiDrop was effective at removing large concentrations of microbial contamination. In all of the trials with challenge waters spiked with 3, 5 and 7 log E. coli, the MadiDrop completely removed the E. coli after 24 hours. After seven months, similar results were seen. Silver ion concentrations evaluated after seven and fourteen days of exposure were below the WHO guideline of 100 µg/L. Agua y Vida has a deep understanding of local contamination issues in communities near the Javari River, a tributary of the Amazon River. They identified MadiDrops as a low-cost technology that would ensure the safety of drinking water where it is consumed – in the home. To demonstrate the effectiveness of the MadiDrop at reducing high pathogen levels, Agua y Vida conducted overnight compartment bag tests (CBT) using water samples collected from the Javari River in Santo Antonio, Brazil. Results showed that E. coli and general coliform levels in the MadiDrop-treated water were undetectable after 12 hours of disinfection. In a primary school northwest of Kampala, A Rocha Uganda and Faith in Water conducted a 6 month study in which drinking water containers with MadiDrops were placed in each classroom. The program was a success – There was a reduction in diarrhea and typhoid cases, improved attendance, and increased concentration in class. Working in the State of Andhra Pradesh, Ultimate Mission empowers women to become medical missionaries, providing basic training in first aid, nutrition, hygiene and clean water safety. With an expanding MadiDrop program in place, Ultimate Mission first used MadiDrops as part of their rural outreach, educating families about why their water, often drawn from bore holes, lakes and streams, makes them sick. “In Venkata Reddy Palli, we do not have good water to drink. We always fall sick from diarrhea. As soon as I received [a MadiDrop], my family started to feel better. Now we are all healthy.” – Lakshmi D.
The Rhino Refugee Camp Settlement, located in Arua District, has housed over 55,000 refugees, mostly from South Sudan. In response to rising concerns about water safety, MadiDrop selected John Jaldak as a MadiDrop Ambassador. John saw a desperate need for safe water, especially among some of the most vulnerable people in the camp. The team provided MadiDrops to female-headed households and to households with disabled or special needs members. Oak Pointe Church worked with Campus Crusades in the remote Pandi Forest region to help displaced people with no access to water treatment equipment such as filters or chemicals. 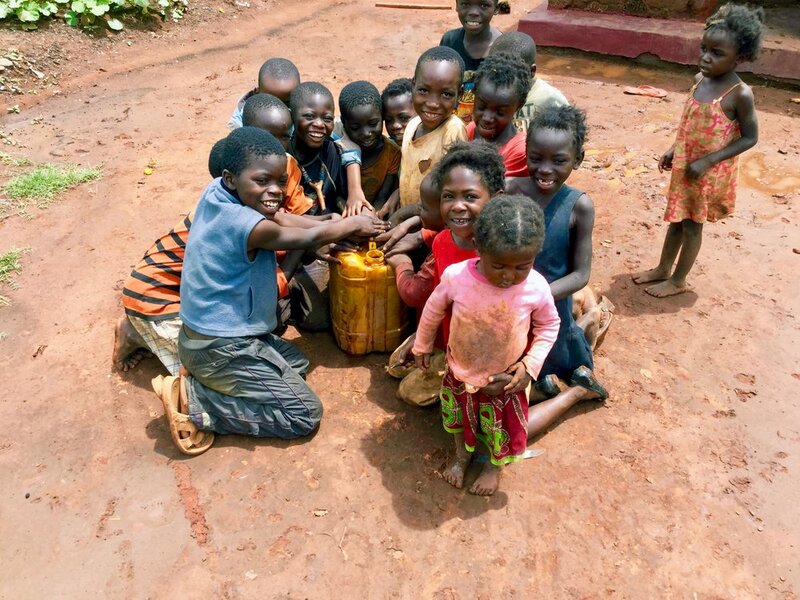 MadiDrops provided a lightweight, easy-to-carry, simple approach to safe drinking water and storage. In Nzali, Carpenter’s Kids – operated by the Anglican Diocese of Central Tanganyika, and supported by St. Paul’s Episcopal Church in Ivy, Virginia – introduced MadiDrops to families in the village. There had previously been no water treatment in place. The communities embraced the MadiDrop, especially since it did not change the taste or smell to the drinking water. Waves of Love had previously used many kinds of filters in the communities they serve, but maintenance issues led to a waste of money and resources. They saw the MadiDrop as a great solution because of its longevity, affordability, and how easy it is to incorporate into people’s daily routines.